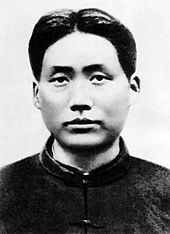 Mao Zedong (/ˈmaʊ (d)zəˈdʊŋ/; December 26, 1893 – September 9, 1976), also known as Chairman Mao, was a Chinese communist revolutionary who became the founding father of the People's Republic of China, which he ruled as the Chairman of the Communist Party of China from its establishment in 1949 until his death in 1976. His theories, military strategies, and political policies are collectively known as Maoism. 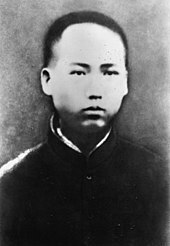 Mao was the son of a wealthy farmer in Shaoshan, Hunan. He had a Chinese nationalist and anti-imperialist outlook early in his life, and was particularly influenced by the events of the Xinhai Revolution of 1911 and May Fourth Movement of 1919. 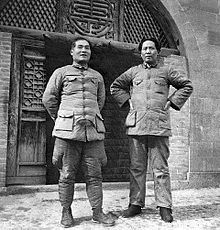 He later adopted Marxism–Leninism while working at Peking University, and became a founding member of the Communist Party of China (CPC), leading the Autumn Harvest Uprising in 1927. 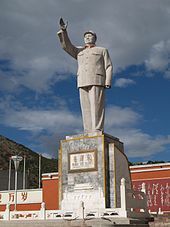 During the Chinese Civil War between the Kuomintang (KMT) and the CPC, Mao helped to found the Chinese Workers' and Peasants' Red Army, led the Jiangxi Soviet's radical land policies, and ultimately became head of the CPC during the Long March. 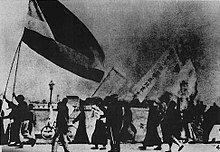 Although the CPC temporarily allied with the KMT under the United Front during the Second Sino-Japanese War (1937–1945), China's civil war resumed after Japan's surrender and in 1949 Mao's forces defeated the Nationalist government, which withdrew to Taiwan. 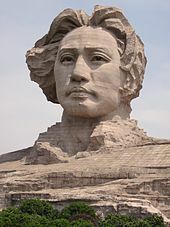 Mao Zedong[lower-alpha 1] (/ˈmaʊ (d)zəˈdʊŋ/; December 26, 1893 – September 9, 1976), also known as Chairman Mao, was a Chinese communist revolutionary who became the founding father of the People's Republic of China, which he ruled as the Chairman of the Communist Party of China from its establishment in 1949 until his death in 1976. His theories, military strategies, and political policies are collectively known as Maoism. On October 1, 1949, Mao proclaimed the foundation of the People's Republic of China (PRC), a single-party state controlled by the CPC. In the following years he solidified his control through land reforms and through a psychological victory in the Korean War, as well as through campaigns against landlords, people he termed "counter-revolutionaries", and other perceived enemies of the state. In 1957, he launched a campaign known as the Great Leap Forward that aimed to rapidly transform China's economy from agrarian to industrial. This campaign led to the deadliest famine in history and the deaths of 20–45 million people between 1958 and 1962. 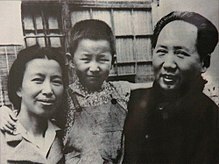 In 1966, Mao initiated the Cultural Revolution, a program to remove "counter-revolutionary" elements in Chinese society which lasted 10 years and was marked by violent class struggle, widespread destruction of cultural artifacts, and an unprecedented elevation of Mao's cult of personality. The program is now officially regarded as a "severe setback" for the PRC. In 1972, Mao welcomed American President Richard Nixon in Beijing, signalling the start of a policy of opening China to the world. 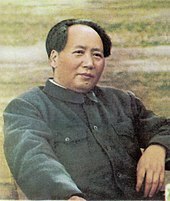 After years of ill health, Mao suffered a series of heart attacks in 1976 and died at the age of 82. He was succeeded as paramount leader by Premier Hua Guofeng, who was quickly sidelined and replaced by Deng Xiaoping. Mao took up residence in Zhongnanhai, a compound next to the Forbidden City in Beijing, and there he ordered the construction of an indoor swimming pool and other buildings. 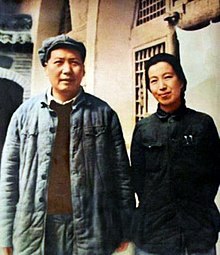 Mao's physician Li Zhisui described him as conducting business either in bed or by the side of the pool, preferring not to wear formal clothes unless absolutely necessary. Li's book, The Private Life of Chairman Mao, is regarded as controversial, especially by those sympathetic to Mao. Mao often visited his villa in Wuhan between 1960 and 1974; the villa includes a garden, living quarters, conference room, bomb shelter and swimming pool. During the land reform, a significant numbers of landlords and well-to-do peasants were beaten to death at mass meetings organised by the Communist Party as land was taken from them and given to poorer peasants, which significantly reduced economic inequality. The Campaign to Suppress Counter-revolutionaries, involved public executions that targeted mainly former Kuomintang officials, businessmen accused of "disturbing" the market, former employees of Western companies and intellectuals whose loyalty was suspect. In 1976, the U.S. State department estimated as many as a million were killed in the land reform, and 800,000 killed in the counter-revolutionary campaign. ↑ Chinese: 毛泽东; Wade–Giles: Mao Tsê-tung; courtesy name Runzhi (潤之). ↑ 毛澤東之謎. Xinchaoshe Press. 2010. p. 21. ISBN 978-986-167-730-9. ↑ Bramall, Chris (December 2011). "Agency and Famine in China's Sichuan Province, 1958–1962". The China Quarterly. 208: 990–1008. doi:10.1017/s030574101100110x. ISSN 0305-7410. ↑ Wemheuer, Felix; Dikötter, Frank (July 2011). 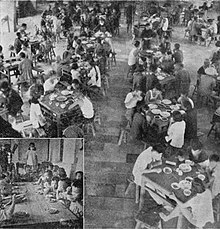 "Sites of Horror: Mao's Great Famine [with Response]Mao's Great Famine: The History of China's Most Devastating Catastrophe, 1958–1962. Frank Dikötter". The China Journal. 66: 155–64. doi:10.1086/tcj.66.41262812. ISSN 1324-9347. 1 2 3 "Source List and Detailed Death Tolls for the Twentieth Century Hemoclysm". Historical Atlas of the Twentieth Century. Retrieved August 23, 2008. ↑ "Resolution on Certain Questions in the History of Our Party Since the Founding of the People's Republic of China," (Adopted by the Sixth Plenary Session of the Eleventh Central Committee of the Communist Party of China on June 27, 1981 Resolution on CPC History (1949–81). (Beijing: Foreign Languages Press, 1981). p. 32. ↑ Webley, Kayla (February 4, 2011). "Top 25 Political Icons". Time. ↑ "Mao Zedong". The Oxford Companion to Politics of the World. Archived from the original on March 21, 2006. Retrieved August 23, 2008. ↑ "Chinese Leader Mao Zedong / Part I". Retrieved April 2, 2015. 1 2 Ebrey, Patricia Buckley (2010). The Cambridge Illustrated History of China. Cambridge University Press. p. 327. ISBN 978-0-521-12433-1. ↑ Schram 1966, pp. 19–20; Terrill 1980, pp. 4–5, 15; Feigon 2002, pp. 13–14; Pantsov & Levine 2012, pp. 13–. 1 2 Schram 1966, p. 20; Terrill 1980, p. 11; Pantsov & Levine 2012, pp. 14, 17. ↑ Pantsov & Levine 2012, p. 36. ↑ Mao Zedong (1992), Schram, Stuart Reynolds; et al., eds., National Revolution and Social Revolution, December 1920 – June 1927, Mao's Road to Power, Vol. II, M.E. Sharpe, p. 465 . ↑ Liu Xiaoyuan (2004), Frontier Passages: Ethnopolitics and the Rise of Chinese Communism, 1921–1945, Stanford: Stanford University Press, p. 66, ISBN 978-0-8047-4960-2 . 1 2 Feigon 2002, p. 50. ↑ Jacobs, Andrew (October 2, 2009). "China Is Wordless on Traumas of Communists' Rise". The New York Times. Retrieved October 2, 2009. 1 2 Robert Palestini (2011). Going Back to the Future: A Leadership Journey for Educators. R&L Education. p. 170. ISBN 978-1-60709-586-6. ↑ Dorothy Perkins (2013). Encyclopedia of China: History and Culture. Routledge. p. 79. ISBN 978-1-135-93562-7. ↑ Burkitt, Laurie; Scobell, Andrew; Wortzel, Larry M. (July 2003). The lessons of history: The Chinese people's Liberation Army at 75 (PDF). Strategic Studies Institute. pp. 340–41. ISBN 978-1-58487-126-2. ↑ Scheidel, Walter (2017). The Great Leveler: Violence and the History of Inequality from the Stone Age to the Twenty-First Century. Princeton University Press. p. 226. ISBN 978-0-691-16502-8. 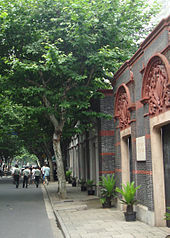 In Zhangzhuangcun, in the more thoroughly reformed north of the country, most "landlords" and "rich peasants" had lost all their land and often their lives or had fled. All formerly landless workers had received land, which eliminated this category altogether. As a result, "middling peasants," who now accounted for 90 percent of the village population, owned 90.8 percent of the land, as close to perfect equality as one could possibly hope for. 1 2 Twitchett, Denis; John K. Fairbank; Roderick MacFarquhar (1987). The Cambridge history of China. Cambridge University Press. ISBN 978-0-521-24336-0. Retrieved August 23, 2008. ↑ Maurice Meisner. Mao's China and After: A History of the People's Republic, Third Edition. Free Press, 1999. ISBN 0-684-85635-2 p. 72: "... the estimate of many relatively impartial observers that there were 2,000,000 people executed during the first three years of the People's Republic is probably as accurate a guess as one can make on the basis of scanty information." ↑ Steven W. Mosher. China Misperceived: American Illusions and Chinese Reality. Basic Books, 1992. ISBN 0-465-09813-4 p. 74: "... a figure that Fairbank has cited as the upper range of "sober" estimates." ↑ Changyu, Li. "Mao's "Killing Quotas." Human Rights in China (HRIC). September 26, 2005, at Shandong University" (PDF). Archived from the original (PDF) on July 29, 2009. Retrieved June 21, 2009. ↑ Brown, Jeremy. "Terrible Honeymoon: Struggling with the Problem of Terror in Early 1950s China". Archived from the original on June 27, 2009. ↑ Alfred W. McCoy. "Opium History, 1858 to 1940". Archived from the original on April 4, 2007. Retrieved May 4, 2007. ↑ "High Tide of Terror". Time. March 5, 1956. Retrieved May 11, 2009. ↑ Yushi, Mao (September 1, 2014). "Lessons from China's Great Famine". CATO Journal. 34: 483–90 – via EBSCOhost. ↑ Smil, V. (1999). "China's great famine: 40 years later". BMJ (Clinical Research Ed.). 319 (7225): 1619–21. doi:10.1136/bmj.319.7225.1619. PMC 1127087. PMID 10600969. ↑ Dikötter, Frank (December 15, 2010). "Mao's Great Leap to Famine". International Herald Tribune. ↑ "Famine 2". web.mac.com. Archived from the original on August 9, 2011. Retrieved 28 July 2015. ↑ Becker, Jasper (2012-10-13). "A utopian nightmare". The Spectator. Retrieved 15 January 2015. 1 2 Thomas P., Bernstein (June 2006). "Mao Zedong and the Famine of 1959–1960: A Study in Wilfulness". The China Quarterly. 186 (186): 421–45. doi:10.1017/S0305741006000221. JSTOR 20192620. ↑ Bernstein, Thomas P. (June 2013). "Book Reviews: Zhou Xun (ed), The Great Famine in China, 1958–1962: A Documentary History". China Perspectives. 2013/2 (Real Estate Speculation and its Social Consequences): 74. Retrieved 15 January 2015. 1 2 Mark O'Neill. hunger for the truth: A new book, banned on the mainland, is becoming the definitive account of the Great Famine. Archived February 10, 2012, at the Wayback Machine South China Morning Post, July 6, 2008. ↑ Becker, Jasper (2002). The Chinese. Oxford UP. p. 271. ISBN 978-0-19-972722-3. ↑ Ion Mihai Pacepa (November 28, 2006). "The Kremlin's Killing Ways". National Review. Archived from the original on August 8, 2007. Retrieved August 23, 2008. ↑ Nipa Piboontanasawat (February 13, 2008). 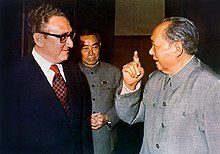 "China's Mao Offered to Send 10 Million Women to U.S. in 1973". Bloomberg. Retrieved July 28, 2015. ↑ "Mao offered US 10 million women". The Australian. February 13, 2008. Retrieved July 28, 2015. ↑ Steve Jackson (February 13, 2008). 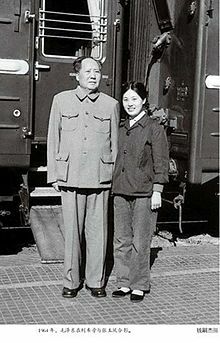 "Papers reveal Mao's view of women". BBC News. Retrieved July 28, 2015. ↑ Cynthia Thuma (2001). The Mongo Mango Cookbook. Pineapple Press Inc. p. 6. ISBN 978-1-56164-239-7. ↑ Alfreda Murck (2013). 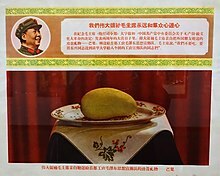 Mao's Golden Mangoes and the Cultural Revolution. University of Chicago Press. ISBN 978-3-85881-732-7. 1 2 3 4 Andrew G. Walder (2015). China Under Mao. Harvard University Press. pp. 280–81. ISBN 978-0-674-05815-6. ↑ Mao's Golden Mangoes and the Cultural Revolution (Press Release). University of Chicago Press, Books. Retrieved 17 August 2018. 1 2 3 Moore, Malcolm (March 7, 2013). "How China came to worship the mango during the Cultural Revolution". The Daily Telegraph. Beijing. Retrieved January 28, 2016. ↑ Marks, Ben. "The Mao Mango Cult of 1968 and the Rise of China's Working Class". Collectors Weekly. Retrieved 2019-02-28. 1 2 "The Kissenger Transcripts: Notes and Excerpts". nsarchive.gwu.edu. Retrieved July 28, 2015. ↑ Maurice Meisner (1999). Mao's China and After: A History of the People's Republic (3rd ed.). Free Press. p. 354. ISBN 978-0-684-85635-3. ↑ "Mao Tse-Tung Dies In Peking At 82; Leader Of Red China Revolution; Choice Of Successor Is Uncertain". The New York Times. Retrieved October 25, 2014. 1 2 3 4 Christine Quigley (1998). Modern Mummies: The Preservation of the Human Body in the Twentieth Century (illustrated, reprint ed.). McFarland. pp. 40–42. ISBN 978-0-7864-2851-9. Retrieved July 28, 2015. ↑ S. L. James. 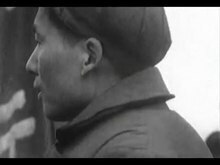 "China: Communist History Through Film". Internet Archive. Retrieved July 28, 2015. ↑ "1976: Chairman Mao Zedong dies". BBC News. September 9, 1976. Retrieved July 28, 2015. ↑ "Chinese Bid Farewell to Nation's Leader". Florence Times + Tri-Cities Daily. UPI. September 18, 1976. Retrieved October 8, 2015. ↑ "Big bad wolf". The Economist. 31 August 2006. Retrieved 28 July 2015. ↑ Galtung, Marte Kjær; Stenslie, Stig (2014). 49 Myths about China. Rowman & Littlefield. p. 189. ISBN 978-1-4422-3622-6. ↑ "Chairman Mao square opened on his 115th birth anniversary". China Daily. December 25, 2008. 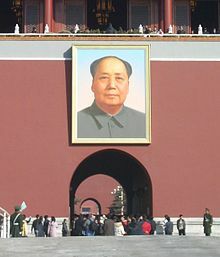 Retrieved January 2, 2013. ; "Mao Zedong still draws crowds on 113th birth anniversary". People's Daily. December 27, 2006. Retrieved January 2, 2013. ↑ MacFarquhar & Schoenhals 2006, p. 471: "Together with Joseph Stalin and Adolf Hitler, Mao appears destined to go down in history as one of the great tyrants of the twentieth century"
↑ Mao Zedong. "Speeches At The Second Session Of The Eighth Party Congress". Retrieved June 28, 2016. ↑ Chang & Halliday 2005, p. 458 [Chang's source (p.725): *Mao CCRM, vol. 13, pp. 203–04 (E: MacFarquhar et al., pp. 494–95)]. ↑ Bernstein, Thomas III (July 2006). "Mao Zedong and the Famine of 1959–1960: A Study in Wilfulness". The China Quarterly. 186: 421–45. doi:10.1017/S0305741006000221. ↑ Jasper Becker. Systematic genocide Archived April 11, 2012, at the Wayback Machine. The Spectator, September 25, 2010. ↑ "Book Reviews: What Everyone Needs to Know about China and Burma". Zocalo Public Square. 2010-04-22. Retrieved February 8, 2015. ↑ "Some China Book Notes". Matt Schiavenza.com. Archived from the original on February 9, 2015. Retrieved February 8, 2015. ↑ 奧巴馬就職演說 引毛澤東詩詞. People's Daily. January 22, 2009. Archived from the original on August 27, 2009. Retrieved July 28, 2015. ↑ Robert Jackson Alexander. International Maoism in the developing world. Praeger, 1999. p. 200.; Jackson, Karl D (1992). Cambodia, 1975–1978: Rendezvous with Death. Princeton University Press. p. 219. ISBN 978-0-691-02541-4. ↑ "Portraits of Sun Yat-sen, Deng Xiaoping proposed adding to RMB notes". People's Daily. March 13, 2006. Retrieved August 23, 2008. ↑ Meisner, Maurice (2007). Mao Zedong: A Political and Intellectual Portrait. Polity. p. 133. ↑ "Cult of Mao". library.thinkquest.org. Archived from the original on June 1, 2008. Retrieved August 23, 2008. This remark of Mao seems to have elements of truth but it is false. He confuses the worship of truth with a personality cult, despite there being an essential difference between them. But this remark played a role in helping to promote the personality cult that gradually arose in the CCP. ↑ "Stefan Landsberger, Paint it Red. Fifty years of Chinese Propaganda Posters". chineseposters.net. Retrieved November 7, 2017. 1 2 Chapter 5: "Mao Badges – Visual Imagery and Inscriptions" in: Helen Wang: Chairman Mao badges: symbols and Slogans of the Cultural Revolution (British Museum Research Publication 169). The Trustees of the British Museum, 2008. ISBN 978-0-86159-169-5. ↑ Lu, Xing (2004). Rhetoric of the Chinese Cultural Revolution: the impact on Chinese thought, Culture, and Communication. Univ of South Carolina Press. p. 65. ISBN 978-1-57003-543-2. ↑ 韶山升起永远不落的红太阳 (in Chinese). Shaoshan.gov.cn. Archived from the original on November 7, 2014. Retrieved October 25, 2014. ↑ "羅氏" literally transliterates as Luo Shi; the character "氏" in Chinese corresponds to the English word "clan", and was a term used in China when the given name of a woman was not recorded. ↑ "Stepping into history". China Daily. November 23, 2003. Retrieved August 23, 2008. ↑ "Mao's grandson, promoted to major general, faces ridicule". Los Angeles Times. August 4, 2010. Retrieved July 29, 2015. ↑ DeBorga and Dong 1996. p. 4. ↑ Barboza, David (2008-01-29). "Zhang Hanzhi, Mao's English Tutor, Dies at 72". The New York Times. ↑ 揭秘毛泽东为什么学英语："这是斗争的需要". people.com.cn. July 9, 2015. ↑ "Mao Zedong Thought – Part 1". Retrieved April 30, 2011. ↑ "100 years". Retrieved August 23, 2008. ↑ Yen, Yuehping (2005). Calligraphy and Power in Contemporary Chinese Society. Routledge. p. 2. ↑ 首屆毛體書法邀請賽精品紛呈. People (in Chinese). September 11, 2006. ↑ Willis Barnstone, The Poems of Mao Zedong (1972; rpr. Berkeley: University of California Press, 2008 ISBN 0-520-93500-4), pp. 3–4. ↑ "Being Mao Zedong". Global Times. July 4, 2011. Retrieved March 15, 2013. ↑ "Famous actor playing Mao Zedong dies". People's Daily. July 5, 2005. Retrieved March 15, 2013. ↑ "Actor famous for playing Mao Zedong dies of miocardial infarction". People's Daily. July 5, 2005. Retrieved March 15, 2013. ↑ Liu, Wei (June 3, 2011). "The reel Mao". China Daily European Weekly. Retrieved March 15, 2013. ↑ Xiong, Qu (November 26, 2011). "Actors expect prosperity of Chinese culture". CCTV News. Retrieved March 15, 2013. ↑ Alan Aldridge; Beatles (1969). The Beatles Illustrated Lyrics. Houghton Mifflin Harcourt. p. 104. ISBN 978-0-395-59426-1. ↑ Spignesi, Stephen J.; Lewis, Michael (2004). Here, There, and Everywhere: The 100 Best Beatles Songs. New York: Black Dog. p. 40. ISBN 978-1-57912-369-7.